"International Exhibition for the Medical and Hospital Equipments"
Actually good exhibition but some staff of exhibitors were weak in English. 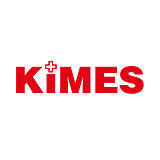 The KIMES 2014 will exhibit the following products and services, IT based medical information system, medical and communication system for hospital communication, medical vehicle for fast and sage delivery, waste disposal management system, new technologies and new products, Hand Held Recording Doppler Set, Thermagraphy, Infrared Thermographic Images System, Stethoscope, Doppler Fetus Pulse Detector, Endoscopic System, Cardiac Output Computer, Biophysical Recording System, Imaging Diagnostic System, Thermometer, Blood Pressure Meter Sphygmoanometer, Rheoencephalograph, Cardiovascular Devices, Autonomic Nervous System Analyzer, Audiometer, Ultrasound Scanner, Urine or Excrement Analyzers, Blood Chemistry Analyzer, Automatic, Blood Gases Test System, Bilirubinometer, Flame Photometer Spectrophotometer, Electrolyte Analyzer, Blood Bank Refrigerator, Centrifuge, Glucose Test System, Freezer, Blood Plasma, X Ray Bone Densitometer, X Ray Film Processor, Simulator, Radiotherapy, X Ray CT Scanner, Diagnostic Radiographic System, Ray Film Processor, X Ray Test Kit, X Ray CT Scanner, Other Radiology Equipment, 4 Cyro Surgery, 4 Instruments Sets, Urological, 4 Operating Light, 4 ENT Unit and Chair, 4 Instruments Sets, Dermatology, 4 Anesthesia Gas Monitor, 4 Instruments Sets, OB GY, 4 Neurological Instruments, 4 Instruments Sets, Bone Surgery, 50. Basic Open Heart Set, 5 Obstetric Delivery Table, 5 Operating Table, 5 Instruments Sets, ENT, 5 Hemo Set.